Vucevic was 8 of 13 from the field and added 12 rebounds. The Magic also got 18 points from Terrence Ross, 17 each from Jonathan Isaac and Evan Fournier, 14 points from D.J. Augustin and 12 from Aaron Gordon, who played despite a sore back, along with 10 from Wes Iwundu. The Magic, fresh from a 20-point win over the Eastern Conference-leading Milwaukee Bucks on Saturday, showed no lack of energy in the runaway win. Orlando shot 47.3 from the floor, threw in 13 3-pointers and won their second straight, their fourth victory in five games. Orlando is now 12-10 in back-to-back sets. The Magic are 8-3 on the first game and 4-7 on the second game. It's the first time Orlando has won back-to-back road games since April 2014. It was the third straight loss for Atlanta, the second straight on its seven-game homestand. Atlanta dropped to 4-10 on back-to-backs. Atlanta has lost five straight home games. Atlanta's John Collins played despite a sore right knee and finished with 15 points and four rebounds. The Hawks also got 16 points from Alex Len, 15 points from Kevin Huerter and 13 points and seven assists from Trae Young. The Magic led 26-25 after the first quarter and used a big second quarter, outscoring Atlanta by 14, to take a 63-48 lead at halftime. Orlando continued its barrage, using a 23-4 run to lead by as many as 26 points in the third quarter. The Magic led 98-74 after the third quarter and had all their starters on the bench by the middle of the fourth quarter. 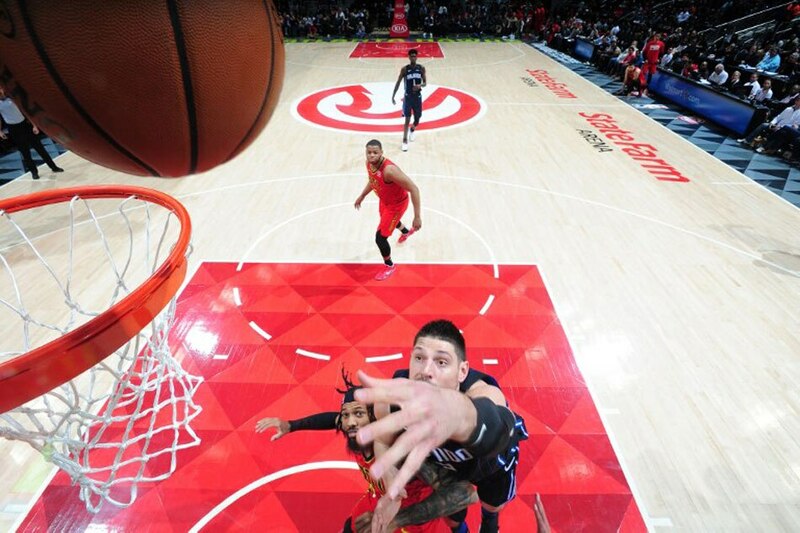 The Magic have won both games against the Hawks this season, both of them in Atlanta. They play two more times this season in Orlando. The Magic finish their three-game road swing on Tuesday against New Orleans. The Hawks play again on Tuesday at home against the Los Angeles Lakers.